Researchers have made great progress in optical devices. The output power of laser, linewidth, stability and noise, as well as the bandwidth of photodetectors, power capacity and common mode rejection ratio have been greatly improved. Microwave electronic devices have also been greatly improved. Then, the coherent optical communication technology has gradually become an important capacity-lifting solution for the current 100G line-side. 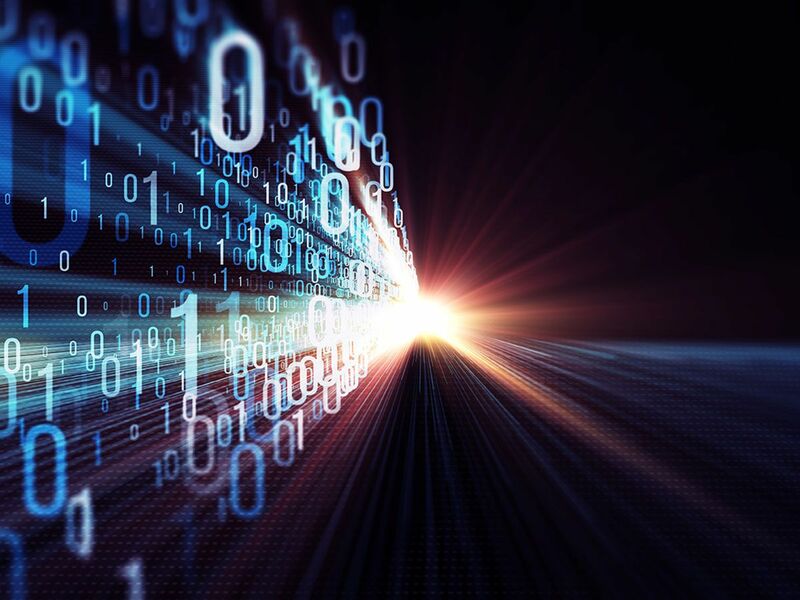 One of the biggest drivers of growth in the current communications market is the transition from 10G to 100G in the metro, core and Data Center Interconnect (DCI) sectors. With the explosive growth of information generated by the use of communication technologies such as video conferencing and the spread of the Internet, the market has proposed higher transmission performance requirements for the physical layer that is the basis of the entire communication system. In terms of digital communication, how to expand the capacity of C-band amplifiers, overcome the deterioration of fiber dispersion effects, and increase the capacity and range of free-space transmission have become important considerations for researchers; in analog communication, sensitivity and dynamic range are key parameters of systems. Driven by strong demand, large-scale DWDM systems are gradually depleting their wavelength resources, and the efficiency of Time-Division Multiplexing (TDM) systems through compressed optical pulses also has a large technical bottleneck. People began to consider replacing the original Wavelength Division Multiplexing (WDM) system with a coherent optical communication system. The coherent optical communication system modulates the signal to the optical carrier by adjusting the amplitude, phase and frequency by means of external light modulation (such as DP-QPSK) at the transmitting end. Compared with the traditional direct detection system, coherent detection can obtain more signal information through the signal light and the beat frequency of the local oscillator; after the signal reaches the receiving end, it uses high-speed Digital Signal Processing (DSP) technology to perform front-end processing such as equalization. The optical mixer and the optical signal generated by the local oscillator are coherently mixed to realize signal reconstruction and distortion compensation. 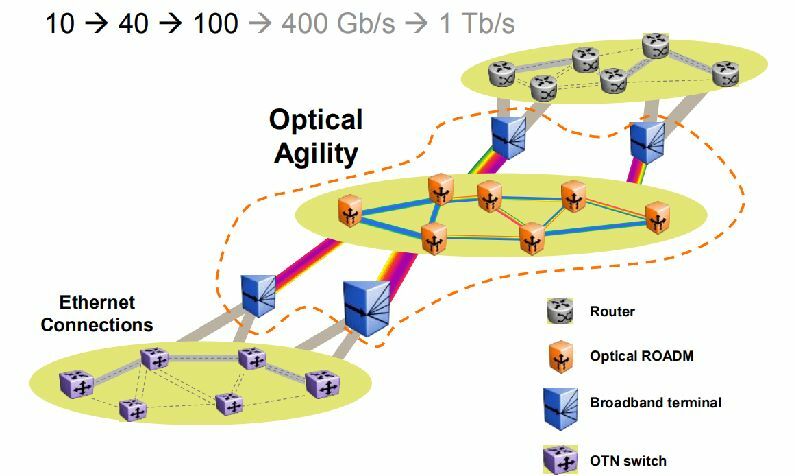 Coherent optics can be used in both 100G and 400G applications, primarily because it enables service providers to send more data over existing fiber, reducing the cost and complexity of network upgrades for bandwidth expansion. At the same time, the application of high-order modulation formats enables coherent optical communication to have higher single-wavelength channel spectrum utilization compared to traditional system systems. Coherent receivers have no special requirements for fiber channel, so coherent optical communication can use already laid fiber lines. With the aid of digital signal processing algorithms, coherent receivers compensate for signal distortion caused by fiber dispersion, polarization mode dispersion, and carrier phase noise at a very small cost. A coherent receiver is about 20 dB more sensitive than a normal receiver, so the distance that is not relayed in the transmission system becomes longer, which reduces the number of amplifications in the transmitted light path. Based on the above reasons, coherent optical communication can reduce the cost of optical fiber erection for long-distance transmission, simplify optical path amplification and compensation design, and become the main application technology of current long-distance transmission network. At present, the coherent optical communication is mainly used on the line side of the backbone network and the metropolitan area network, and belongs to the technical research field of DWDM long-distance transmission. In the application scenarios of the metropolitan area network and the core network with distance more than 80km, the coherent optical communication features good performance of Optical Signal-to-Noise Ratio (OSNR), sensitivity, dispersion tolerance and so on. The operating wavelength range is C-band (1530nm to 1565nm), and the fiber type is G.652D (prefered) or G.655. The key performance index is OSNR. 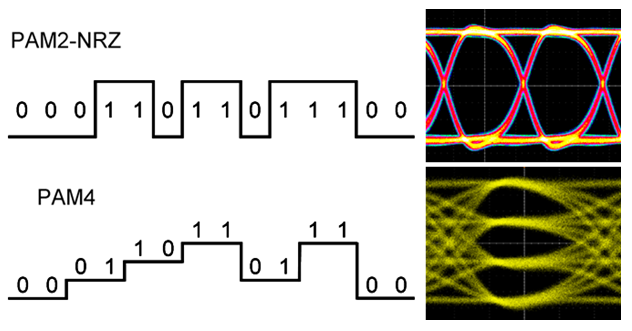 Error correction coding technology can jump out of the limitations of the physical layer of transmission, and compensate for all physical transmission impairments at the logic layer, especially the effects of nonlinear effects. In the 5G middlehaul scenario, 100G/200G DWDM system will be deployed, and the 100G CFP-DCO and 200G CFP2-DCO optical module can be used to implement the 80km scene application; the 400G DCO product is applied in the 5G backhaul scenario with distance less than 200km. Whether the coherent communication will be used in the DCI field of 40km to 80km depends mainly depends on the commercial cost performance and whether the market capacity is large enough. At the current 100G rate, products such as 100G ER with EML modulation are sufficient for the use; the 100G CFP-DCO ZR series will appear in the future. The OIF organization is developing a 400ZR specification that uses a combination of DWDM and coherent technology. Andrew Schmitt, principal analyst at Cignal AI, said: "Coherent 400G will limit the development of existing 200G and 100G technologies by 2020, and new devices will maximize optical capacity without relying on coverage." Foreseeable Yes, more and more 400ZR products will enter the market. The coherent optical communication system is a more advanced and complex optical transmission system suitable for longer distance and larger capacity information transmission. At present, coherent modules with the CFP form-factor are bulky and consume large power. Compact coherent modules will replace existing coherent products. The innovation of semiconductor technology and the improvement of chip technology will greatly promote the replacement of 400G coherent products. 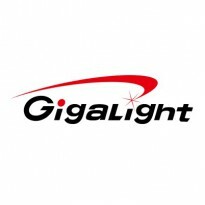 In recent years, Gigalight, a global optical interconnect innovator, has increased its research and development of coherent modules and has achieved a series of achievements. In the next few years, it will strengthen cooperation with the industry and jointly promote the progress of related industries. 1. 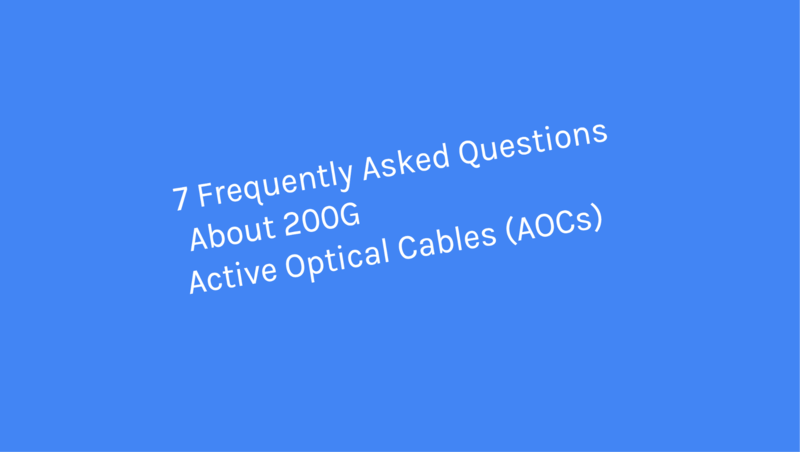 What Are the Benefits of Using 200G AOCs? 2. What 200G AOCs Are Available on the Market? Currently, there are only a few suppliers of 200G AOCs on the market, for example, the Gigalight company — a leader in the AOC industry. Gigalight offers a full range of 200G AOCs in both QSFP-DD and QSFP56 form-factors. The Gigalight 200G AOC product line includes 200G QSFP-DD AOC, 200G QSFP-DD to 2x 100G QSFP28 AOC, 200G QSFP-DD to 4x 50G QSFP28 AOC, 200G QSFP56 AOC, 200G QSFP56 to 2x 100G QSFP56 AOC, 200G QSFP56 to 4x 50G SFP56 AOC. All of these cable assemblies are compliant to IEEE standards and industry Multi-Source Agreements (MSAs). The QSFP-DD stands for a "Quad Small Form-factor Pluggable–Double Density". The QSFP-DD connector also has 8 electrical lanes similar to the QSFP form-factor, but the second row of electrical contacts has been added to the QSFP connector in order to increase the number of high-speed electrical lanes from 4 (in a QSFP) to 8 (in a QSFP-DD). The QSFP56 stands for "Quad Small Form-factor Pluggable 56 ('56' refers to the max data rate 56Gb/s each electrical interface can handle)". The QSFP56 form-factor is a solution for 200G applications. It's a pluggable form-factor that has the same size as QSFP. 3. Can QSFP56 AOC Support QSFP-DD AOC Ports or Can QSFP-DD AOC Support QSFP56 AOC Ports? Yes. The QSFP56 is a pluggable form-factor that has the same size as QSFP. The QSFP-DD assemblies are backward compatible with existing QSFP, so your 200G QSFP56 AOC can be used in the 200G QSFP-DD AOC system ports. Your 200G QSFP-DD AOC also can be used in the 200G QSFP56 AOC system ports. 4. What Is the Maximum Distance of 200G AOCs? For Gigalight's 200G AOCs, a max length of 100m is supported for both QSFP-DD AOCs and QSFP56 AOCs using OM4 MMF. 5. What Industry Standards Are Associated with 200G AOCs? The QSFP-DD series AOCs are compliant with the QSFP-DD MSA while the QSFP56 series AOCs are compliant with the QSFP MSA. 6. What Is the Maximum Power Consumption of 200G AOCs? The maximum power consumption of 200G QSFP-DD AOCs (based on NRZ) is 4w per end while that of 200G QSFP56 AOCs (based on PAM4) is 7w per end. In general, higher power consumption levels are associated with higher data rates and longer reach. 7. Where Are 200G AOC Used? The 200G AOCs are suitable for short distances and offer a cost-effective solution to connect within racks and across adjacent racks. While the 200G Direct Attach Cables (DAC) are a low-cost solution for 200GE high-speed interconnects within the reach up to 3 meters only, the 200G AOCs pick it up from there and can reach up to 100 meters. The 200G AOCs are widely used in High-Performance Computing (HPC) and recently became more popular in hyperscale data centers, enterprise and storage systems. Today’s hyperscale data centers and High-Performance Computing (HPC) markets require low-cost solutions for high-performance AOCs for the large-scale adoption of 200G and 400G data rates. According to a recent report from LightCounting, the multi-mode AOC market will be experiencing significant growth over the next five years in the HPC and large-scale data center applications. However, the market for 100G AOC is continually growing in the HPC and large-scale data center applications now, and it is still too early to adopt 400G AOC owing to cost and others so that the adoption of 200G AOC is expected to grow in the next years. In the 200G AOC market, the 200G QSFP-DD AOC is a kind of parallel transceiver optics assembly. It will be the huge potential market and it is possible to replace copper technology in HPC and data center, the reasons include form factor, cost and so on. Next, we will explore them together. Why Is 200G QSFP-DD AOC More Likely to Be Popular? The 200G QSFP-DD AOC is a kind of 200G AOC that adopts the QSFP-DD form factor. QSFP-DD is an eight-channel electrical interface with an additional row of contacts. It is being developed by the QSFP-DD MSA as a key part of the industry’s effort to enable high-speed solutions. The 200G QSFP-DD AOC meets the requirements of QSFP-DD MSA specification. The QSFP-DD modules are similar to current QSFP. The systems designed with QSFP-DD modules can be backward compatible, allowing them to support existing QSFP modules and provide flexibility for end users and system designers. The 200G QSFP-DD AOC is convenient for end users and system designers. Gigalight is one of the rare providers for 200G QSFP-DD AOC. Its 200G QSFP-DD AOC is driving from its innovative optical packaging and the key manufacturing technologies enable scalability, reduced power consumption, increased reliability, and superior module performance for optical communications. Gigalight 200G QSFP-DD AOC adopts self-developed COB (Chip on Board) high-precision technology. The cost of the product is lower and the volume is smaller, which can provide a new generation solution with low cost, low power consumption, high density and high speed for the data center. According to data disclosed by Google, Facebook, etc., the internal traffic of these Internet giant data centers is increasing by nearly 100% every year. Currently, some Internet giants deploying 100G earlier have begun to seek higher-speed solutions, and the choice of next-generation data centers has become A topic that everyone is enthusiastic about. The 400G Ethernet standard is preceded by the 200G Ethernet standard, which may reflect the industry’s mindset—more optimistic about 400G, or 200G is just a transition solution for 400G. But directly from 100G to 400G is actually not very scientific. First of all, from the data center side, we need to rebuild the ultra-large-scale data center and define a new specification architecture. The requirements for rack power in the 400G era switch will be quite high, and the traditional air-cooling heat dissipation is more difficult. Furthermore, the 400G data center will use PAM4 technology, and the PAM4 technology will make the system less transparent and difficult to manage. The traditional NRZ technology together with the parallel technology can make the data center easy to manage. In order to more flexibly adapt to the needs of the future data center and achieve a perfect transition to the 400G data center, Gigalight recently completed a low-cost data center internal parallel optical interconnection solution based on 200G NRZ transmission. This paper mainly compares 200G NRZ—Two parallel technologies in the solution, and two products as an example for simple analysis. Fiber Parallel Solution—Is It Single- or Multi-Mode? 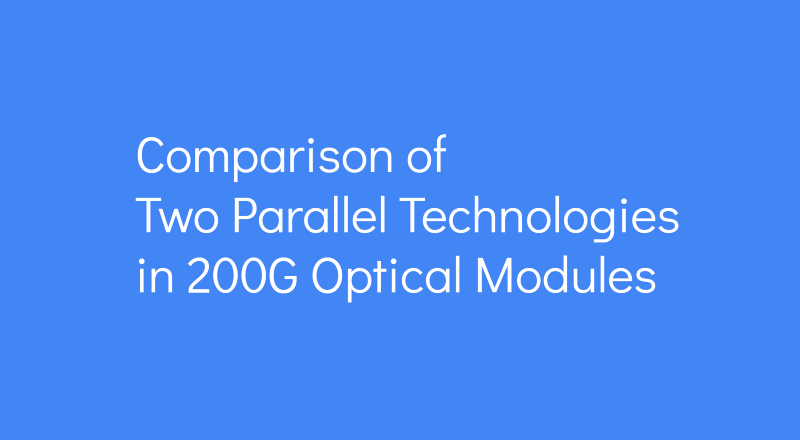 The traditional parallel optical module products are mainly based on optical interconnect technology of multimode fiber, and have the advantages of high bandwidth, low loss, no crosstalk and matching and electromagnetic compatibility problems. They have gradually replaced copper-based electrical interconnection products and are used in cabinets. High-speed interconnection between the boards, the connection distance is up to 300 meters under the OM3 fiber. At the same time, in order to apply to longer-distance transmission solutions, Parallel Single-Mode (PSM) optical modules have emerged, mainly using FP lasers to transmit 2km in single-mode fiber and DFB to transmit 10km applications, which is more difficult than multi-mode interconnection technology. Data center cabling is a very complicated problem. The choice of multimode fiber or single-mode fiber has been the subject of heated discussion in the industry. There are also choices in major data centers. For example, in the 100G era, Facebook chooses single mode, Google chooses both multimode and single mode. At the same time, BAT (Baidu, Alibaba, Tencent) chooses multimode. From the perspective of cost, multimode fiber is expensive and multimode optical module is cheap. Single mode fiber is cheap and single mode optical module is expensive. Therefore, it is easy to combine the cost of fiber and optical module to obtain the relationship between distance and cost. Taking the 100G solution as an example, the cost advantage of a multimode solution is very obvious when the fiber distance is within 100 meters. The parallel technology route is characterized in that each pair of multimode fibers respectively carries one optical signal. At present, IEEE’s 400G SR16 standard is a 16x 25G parallel solution, which requires 16 pairs of multimode fiber. It is far more than the 12-core MPO widely used in the 100G era, which will lead to a significant increase in cost; more importantly, multimode optical modules rely on The low-cost VCSEL optical chip solution, 2020, is likely to still require more than 12-core MPO’s 8-pair multimode fiber. The 400G SR4 that the existing 12-pin MPO can accommodate seems to be in the foreseeable future. Therefore, in 2020, if there is no open and standardized multi-mode wavelength multiplexing technology (such as SWDM technology), low-cost VCSEL 100G technology can not achieve breakthrough, 400G multi-mode fiber solution cost advantage will no longer be obvious, single-mode fiber It may become mainstream in large-scale data centers, and short- and medium-range single-mode parallel solutions will be a cost-effective alternative to multi-mode parallel solutions. ——Yang Zhihua, "Top Ten Hotspots of Data Center Network Technology in 2020"
Based on Gigalight’s unique PSM series product line, Gigalight recently released a new product—200G QSFP-DD PSM8, a high-speed product of single-mode parallel technology. To achieve long-distance transmission, single-mode fiber with low dispersion loss must be used. To achieve high coupling efficiency between single-mode fiber and semiconductor, it is necessary to shape the light field emitted by the semiconductor laser to maximize the incident light field and the intrinsic optical field of the fiber. And the 200G QSFP-DD SR8 uses an 8-channel 850nm VCSEL array that complies with the 100GBASE-SR4 protocol standard. The 200G QSFP-DD SR8 is a multimode parallel product. With the traditional VCSEL advantage platform, Gigalight uses a simple, efficient and reliable fiber coupling process technology to add a 45° prism between the laser and the fiber. The special material treatment of the fiber surface increases the coupling efficiency of the fiber to over 80%. The two products are similar in that they belong to the optical modules in the 200G data center solution, and all use the QSFP-DD package, which can use the 16-core MTP. The advantage of QSFP-DD is that the 1U panel can achieve a density of 36x 200G/400G, and it is forward- and backward compatible with QSFP, and is compatible with existing QSFP28 optical modules and AOC/DAC. 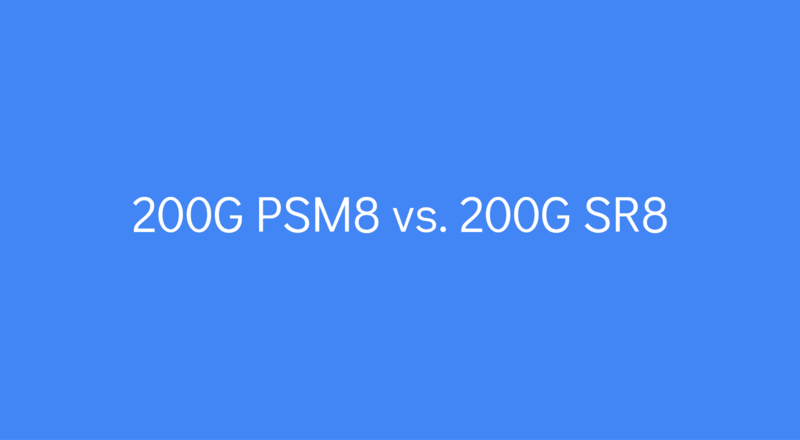 The main difference is that the 200G QSFP-DD PSM8 adopts an 8-way 1310nm single-mode fiber parallel solution with a transmission distance of up to 10km. The 200G QSFP-DD SR8 adopts a multi-mode fiber parallel solution and can travel over the OM4 fiber link. Up to 100m. The multi-mode parallel solution is the core of the current data center development, and the transmission distance between the switch and the core switch is just within the scope of the multi-mode fiber. Corning has introduced OM5 fiber in the past few years, but it has not caused the expected market reaction. The SWDM short-range wavelength division multiplexing scheme is only promoted by a few manufacturers—it is indeed lacking in the market. In the near future, if a general enterprise data center wants to continue to use standard-certified solutions and reduce the cost of optical components, you can choose multi-mode parallel optics—after all, SMBs do not need as large a capacity as 400G. However, if it is in the construction and deployment process of a very large-scale data center, especially considering the scalability of the system and the flexibility of the system, we should probably consider the single-mode parallel solution. In the eyes of some people of insight, the single-mode parallel solution increases the number of fiber cores, but overall reduces the maintenance complexity, is easier to manage, and is easier to upgrade from 100G to 400G later. Without increasing fiber resources, the current 100G CWDM4 based on wavelength division multiplexing can only evolve to 200G FR4, and 100G PSM4 can be upgraded to 400G DR4). ——Li Mofei, "Review of Data Center: Cost Technology is Concise and Reconfigurable"
In general, the technology roadmap for major switch and transceiver vendors shows a very clear and simple migration path for customers deploying parallel optics. So when optics are available and migrated from 100G to 200G or 400G, their fiber infrastructure still exists and no upgrades are required. Reliability, product life and maintenance costs are all interrelated. The parallel single-mode solution represented by 200G QSFP-DD PSM8 in total cost should be the cabling guide for large-scale data centers in the future. QSFP-DD, OSFP, and CFP8: Which Is the Best for 400G? There are three criteria for a successful form-factor: small size, low power consumption, and interoperability between all systems vendors. As we all know, the SFP/SFP+ and QSFP+/QSFP28 are successful form-factors for 1G/10G and 40G/100G networks. In fact, for 100G networks, there are 4 different form-factors: CFP, CFP2, CFP4, and QSFP28. The transmission departments in telecommunication networks need a pluggable transceiver able to cover long reach also using some dedicated technologies such as Coherent detection, while data centers need a small form-factor with the lowest power consumption and the lowest cost per unit due to their application is for short reach only (max 2km generally). During the first instances of the 100G transceivers, the CFP form-factor was preferred because it was impossible to make a transceiver less than 12W power consumption, even for intermediate reach. Once the technology and components availability were better, it was then feasible to CFP2, and then CFP4. Still today, the Coherent technology for 100G and 200G is only available on CFP and CFP2 form-factors. In parallel, the GAFA (Google, Apple, Facebook, and Amazon) with their phenomenal need for additional data center capacity, have pushed the QSFP28 form-factor for various short reach applications such as DAC, AOC, SR4, PSM4, and CWDM4. Today, with the technology maturity and QSFP28 wide-adoption, most of the 100G applications are available on QSFP28 form-factor, with some exceptions for reach more than 40km, including Coherent detection. Who need the 400G transceivers? Any interoperability with former form-factors? Following the market situation, 400G is a priority for the intra-connections in large data centers and at a lower scale for the transmission department in telecommunication networks. Because the 400G bit-rate requires PAM4 modulation, the reach is becoming more and more challenging and is limited to a few kilometers only. Longer reach will require Coherent detection technology and/or amplification, dispersion compensation, etc. Again, we will observe a similar scenario: for 400G networks, a dedicated form-factor for the data center intra-connection (Intra-DC) and another one for transmission. However, thankfully it seems that “intermediate” form-factors won’t happen for 400G. 400G is coming with 2 form-factors for Intra-DC: QSFP56-DD (QSFP-DD for QSFP Double Density) and OSFP (Octal SFP). Both form-factors are running 8 lanes of 50G PAM4 on the electrical side while the optical side can be either 8 lasers of 50G PAM4 or 4 lasers of 100G PAM4. In the 4-laser design, a “gearbox” is added to convert the PAM4 electrical signal from 8x50G to 4x100G. OSFP allows more power (15W) than QSFP-DD (12W) so that the OSFP allows an early adoption because it’s easier to release a technology designed for 15W than 12W. 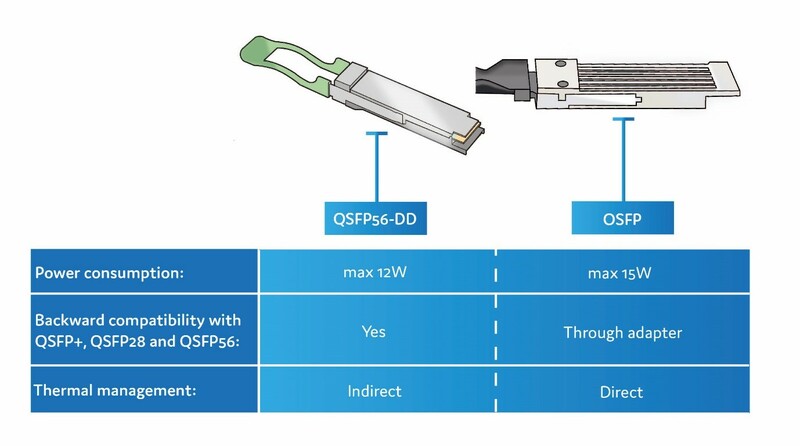 QSFP-DD port is backward compatible with QSFP including 40G QSFP+, 100G QSFP28, and 200G QSFP56, while OSFP port requires a QSFP to OSFP adapter. OSFP integrates thermal management directly into the form factor, but QSFP-DD does not. Both QSFP-DD and OSFP are designed for intra-DC applications including DAC, AOC and optical connection up to 2km. Additional variants will come for other applications such as Data Center Interconnect (DCI) with longer reach and other technology like DWDM super channel. It allows up 24W power consumption. It has 16x25G NRZ on the electrical side instead of 8x50G PAM4 for QSFP-DD and OSFP. It has an MDIO management interface instead of I2C for QSFP-DD and OSFP. 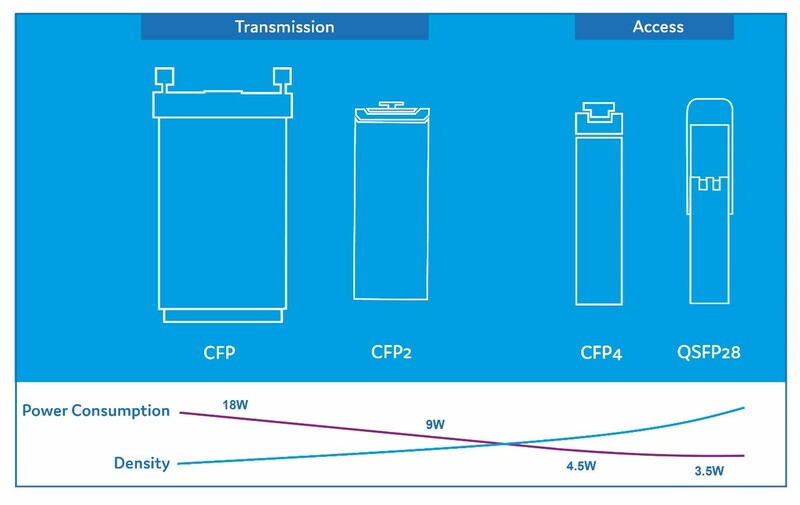 With its large space and max 24W power consumption, the CFP8 is intended for transmission application. Available in an initial version of 10km, it has 16 electrical lanes of 25G NRZ which are converted to 8 lanes of 50G PAM4. However, other variants are coming for longer reach, including Coherent detection technology. A version called CFP8 ZR (80km) will come at a later stage but it also opens the door for a CFP8 800G! 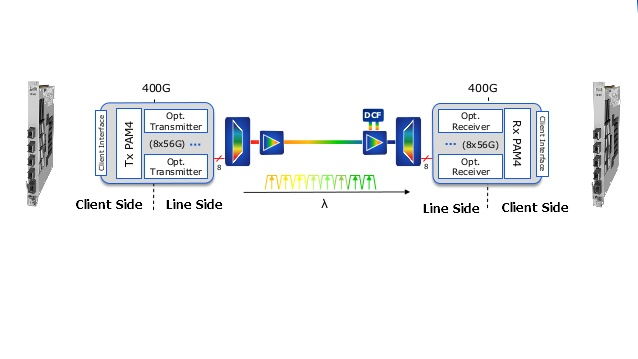 By using the 16 electrical lanes and apply a 50Gbps PAM4 signal, it is feasible to reach 800G; then adding a DSP, Coherent detection and multiplexing lasers will enable the optical transmission. Clearly, this is not for today yet. For 400G applications, others form-factors than the one listed above are also available, but for dedicated applications. We can list the COBO (Consortium for On-Board Optics) and the CDFP for cable application enabling 16 electrical lanes of 25Gbps. Related article: QSFP-DD Might Be the Mainstream Form-factor of 400G Optical Transceivers. Originally published at QSFP-DD, OSFP, and CFP8: Which Is the Best for 400G?. The shift to cloud services and virtualized networks has put the data center in the middle of our world and meant that connectivity within data centers and between data centers has a huge impact on the delivery of business and personal services. Hyperscale data centers are being installed across the world and these all need connecting. To meet this demand, optical transceiver suppliers are delivering new solutions based on PAM4 and 64QAM, providing coherent modulation that will drive down the cost of connectivity and increase the bandwidth of each connection. Connections to many servers are already 25G and links between switches in large data centers are already 100G. The introduction of SFP28 and QSFP28 transceivers integrating new technologies and built using efficient manufacturing techniques has driven down the cost of these connections and allowed massive growth in the market. The next stage is the introduction of 100G single lambda solutions and cost-effective 400G transceivers for links between switches. The PHY devices needed for this next step are already becoming available, 12.8T switch devices are in production, and the first 400G QSFP-DD and OSFP optical transceivers are sampling. The rise of the hyperscale data center operator has dramatically changed the market. The switch to 25G and 100G from 10G and 40G has happened very quickly. The sheer scale and numbers of data centers being installed or upgraded means that the new technologies can be shipped in volume as soon as the price is right, the components have been qualified, and the production lines are operational. We are now seeing the first 400G PHY devices and optical transceivers for data centers becoming available and companies are vying for market position as we wait for the leading hyperscale operators to commit to large deployments. Many of those companies that have benefited from 25G and 100G are putting their investments into single lambda PAM4 100G and 400G solutions for the data center. This has required new PAM4 PHY devices designed to meet the power constraints of 400G OSFP and QSFP-DD transceivers. A few companies have also invested in 50G and 200G PAM4 PHYs, enabling a cost-effective upgrade from 25G and 100G. 50G SFP56 and 200G QSFP56 transceivers are expected to be interim solutions, but it is unclear how widespread their use will be or for how long. 40G was an interim solution that lasted for many years. 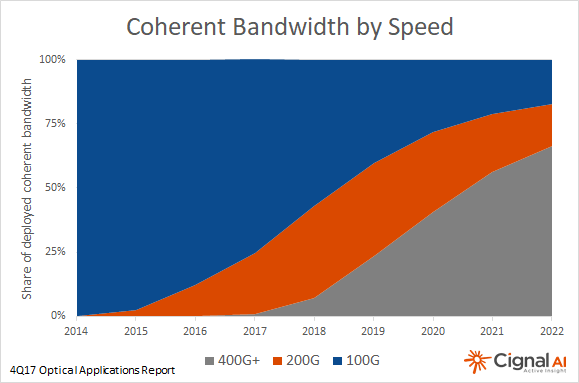 Coherent technology, originally developed for 100G long-haul networks, is now widely used for long-haul connections, including subsea, metro networks, and Data Center Interconnect (DCI) between data centers. The market for DCI has grown rapidly, with many systems vendors offering solutions with 80km to 500km reach. For long-haul and metro applications, several leading equipment manufacturers continue to use in-house coherent Digital Signal Processor (DSP) designs. Coherent DSP solution is now available to optical transceiver vendors such as Gigalight that is going to ship 400G transceivers based on this design. The latest DSP ASICs are enabling 600G (64Gbaud 64QAM) solutions and CFP2-DCO transceivers. The next step is the introduction of the 7nm DSPs that will enable the cost-effective 400G ZR transceivers planned for 400G links up to 100km starting in 2020. This continues to be a market in flux. Lumentum has completed the acquisition of Oclaro, Cisco has completed the acquisition of Luxtera, and several Chinese optical transceiver vendors have joined the charge to 400G in the data center. The PAM4 PHY devices required for 100G single lambda and 400G in the data center are proving to be very challenging to deliver. PAM4 PHY solutions in 28nm and 14/16nm technology have been sampling for more than six months and these are now being joined by 7nm solutions. PAM4 (4-Level Pulse Amplitude Modulation) is one of PAM modulation technologies that uses 4 different signal levels for signal transmission. Each symbol period can represent 2 bits of logic information (0, 1, 2, 3), that is, four levels per unit time. In the data center and short-distance optical fiber transmission, the modulation scheme of NRZ is still adopted, that is, the high and low signal levels are used to represent the (1, 0) information of the digital logic signal to be transmitted, and one bit of logical information can be transmitted per signal symbol period. However, as the transmission rate evolves from 28Gb/s to a higher rate, the electrical signal transmission on the backplane will cause more severe loss to the high-frequency signal, and higher-order modulation can transmit more data in the same signal bandwidth. Therefore, the industry is increasingly calling for higher-order PAM4 modulation. The PAM4 signal uses four different signal levels for signal transmission, and each symbol period can represent 2 bits of logical information (0, 1, 2, 3). Since the PAM4 signal can transmit 2 bits of information per symbol period, to achieve the same signal transmission capability, the symbol rate of the PAM4 signal only needs to reach half of the NRZ signal, so the loss caused by the transmission channel is greatly reduced. With the development of future technologies, the possibility of using more levels of PAM8 or even PAM16 signals for information transmission is not ruled out. And then, if the optical signal can also be transmitted by using the PAM4, the clock recovery and pre-emphasized PAM4 signal can be directly realized when the electro-optical transmitting is performed inside the optical module, therefore, the unnecessary step of converting the PAM4 signal into the NRZ signal of 2 times the baud rate and then performing related processing is eliminated, thereby saving the chip design cost. The end-to-end transmission system includes fiber optic and fiber-optic transmission systems. Since the fiber transmission can easily reach the rate of 25Gbd so that the research progress of transmitting PAM4 on the fiber has been progressing slowly. For fiber-optic transmission systems, from NRZ moving to PAM4 is considered in terms of cost. If you do not need to consider the cost, there are other related modulation technologies can be used in the long-distance range, such as DP-QPSK, which can transmit the baud rate signal above 50Gbd for several thousand kilometers. However, in the data center field, the transmission distance is generally only 10km or less. If the optical transceiver using PAM4 technology is adopted, the cost can be greatly reduced. For 400GE, the largest cost is expected to be optical components and related RF packages. PAM4 technology uses four different signal levels for signal transmission. It can transmit 2 bits of logic information per clock cycle and double the transmission bandwidth, thus effectively reducing transmission costs. For example, 50GE is based on a single 25G optical device, and the bandwidth is doubled through the electrical layer PAM4 technology, which effectively solves the problem of high cost while satisfying the bandwidth improvement. The 200GE/400GE adopts 4/8 channel 25G devices, and the bandwidth can be doubled by PAM4 technology. For data center applications, reducing the application of the device can significantly reduce costs. The initial goal of adopting higher order modulation formats is to place more complex parts on the circuit side to reduce the optical performance requirements. The use of high-order modulation formats is an effective way to reduce the number of optics used, reduce the performance requirements of optics, and achieve a balance between performance, cost, power, and density in different applications. In some application scenarios, high-order modulation formats have been used for several years on the line side. However, since the client side needs are different from the line side, so other considerations are needed. For example, on the client side, the main consideration is the test cost, power consumption and density. On the line side, spectrum efficiency and performance are mainly considered, and cost reduction is not the most important consideration. By using linear components on the client side and the PAM4 modulation format that is directly detected, companies can greatly reduce test complexity and thus reduce costs. Among all high-order modulation formats, the lowest cost implementation is PAM4 modulation with a spectral efficiency of 2 bits/s/Hz. As a popular signal transmission technology for high-speed signal interconnection in next-generation data centers, PAM4 signals are widely used for electrical and optical signal transmission on 200G/400G interfaces. Gigalight has a first-class R&D team in the industry and has overcome the signal integrity design challenges of PAM4 modulation. Gigalight's 200G/400G PAM4 products include 200G QSFP56 SR4, 200G QSFP56 AOC, 200G QSFP56 FR4, 400G QSFP56-DD SR8, 400G QSFP56-DD AOC, etc. All of the PAM4 products from Gigalight can be divided into digital PAM4 products and analog PAM4 products. The digital PAM4 products adopt DSP solutions which can support a variety of complex and efficient modulation schemes. The electric port has strong adaptability and good photoelectric performance. And the analog PAM4 products simulate CDR with low power consumption and low cost. Gigalight always adheres to the concept of innovation, innovative technology, and overcomes difficulties. It invests a lot of human resources and material resources in the research and development of next-generation data center products.